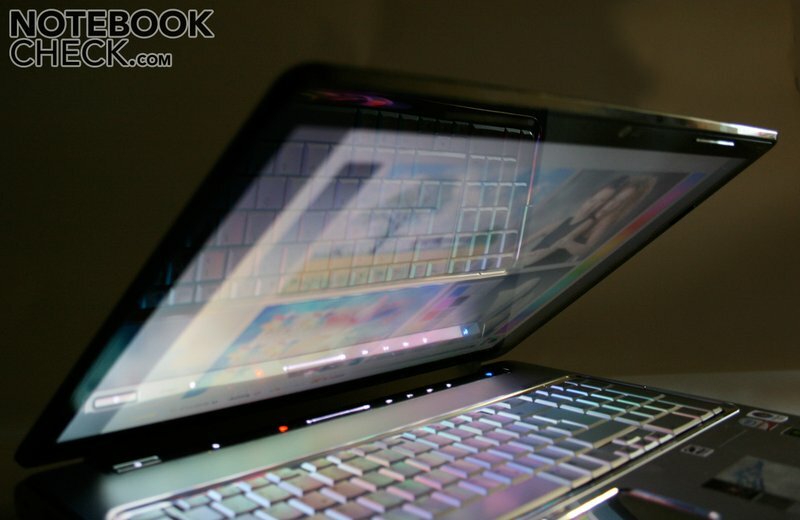 The Pavilion dv7-1050eg and the dv7-1045eg by HP are equipped with a big 17" wide screen, a Blu-Ray ROM drive, a playable middle-class graphics card, and of course they have the new liquid metallic design. This article covers whether this notebook is a good bundle. A note about the model: The model under review, the dv7-1050eg, is meant for retail sales and is according the HP's web site identical to the 1045eg, which a lot of Internet shops list. 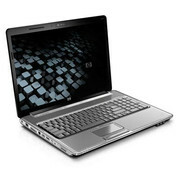 So, we also include the links to the HP Pavilion dv7-1045eg in our price comparison section. Alike the smaller brother, the HP Pavilion dv5-1000 series, also the design of the dv7-1000 series has the new striking Pavilion design. It is dominated by bevelled edges and high-gloss surfaces. So, perfectionists should always have a microfibre cloth ready to hand. The colours used for the dv7 series are only a combination of black, silver, and metallic silver (chrome look, called 'liquid metallic' by HP). The stability of this futuristic case is very good. Base unit and display cover are very resistant against force and seem to be stable. Even lifting the case (a show of strength, because the case weighs 3.46 kg) does only lead to marginal creaking. Another special feature of this design is the central hinge, which is nearly as wide as the whole width of the case. Unfortunately, due to its construction, it limits the number of interfaces on the back side and the opening angle of the lid. Furthermore, it is not easy to move and the display see-saws relatively heavily after adjusting the opening angle. The connectivity options are alike the one of the smaller dv5-1000 series very complete (they are identical to the reviewed dv5-1032eg). Highligts are an HDMI port, an eSATA port (with integrated USB jack), a proprietary docking port and two headphones jacks. Identical to the dv5-1032eg, the 1050eg of the dv7 series does neither have a modem port nor a built-in TV card (which is available in some other dv7 models). 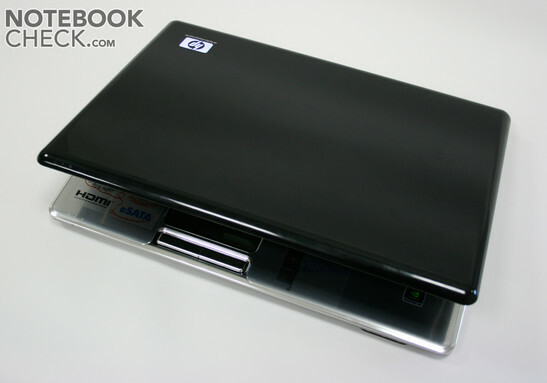 The optical drive provided by HP is a Blu-Ray ROM drive, which allows to play Blu-Ray movies. Furthermore, it can also read and write CDs and DVDs. The price includes 24 month manufacturer warranty (pick-up and bring-back service, material and work) and some software. However, among the pre-installed software there are only two which can be used for a longer time, MS Works (a smaller Office) and the Cyberlink DVD Suite. Norton Internet Security and MS Office Home and Student 2007 can only be used with all features for 60 days and have to be bought afterwards. 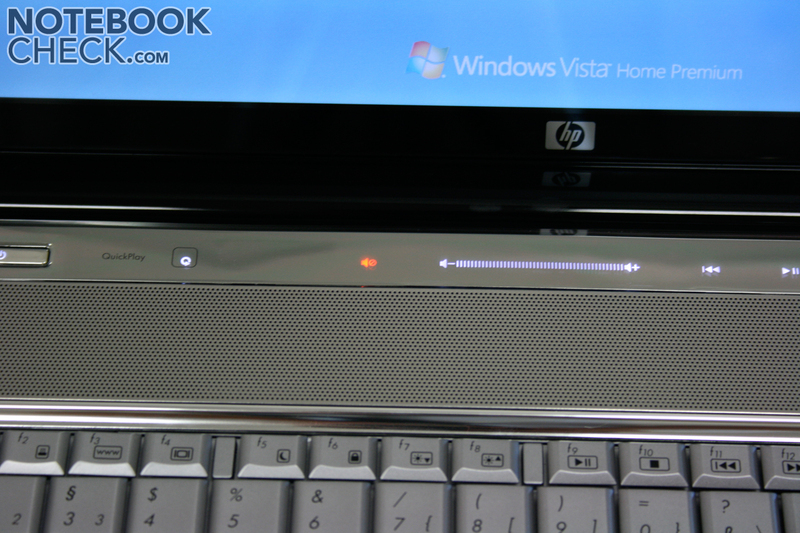 HP utilizes all the available width of the dv7-1050eg and provides a big keyboard with number pad. Compared to the keyboard of the dv5-100 series, the cursor keys and the position keys (Pos1, End, Page Up, Page-Down) are shrunk in order to have sufficient space for a number pad. The layout is again very good and allows touch typing at once. Because of the sufficient key travel and the good key feedback, we also liked typing with this keyboard. However, the stability of the keyboard was not as good as the stability of the dv5. So, the keyboard slightly gave in its centre. The size of the touchpad is also sufficient. However, its look was considered more important than the gliding properties of its surface. Using the touchpad for a longer time turned out to be rather cumbersome. 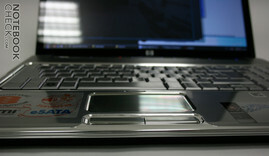 Furthermore, the silver touchpad surface is sensitive to dirt. The button above it which allows to easily switch the touchpad off or on and the according indicator LED for the operating state of the touchpad are very handy. 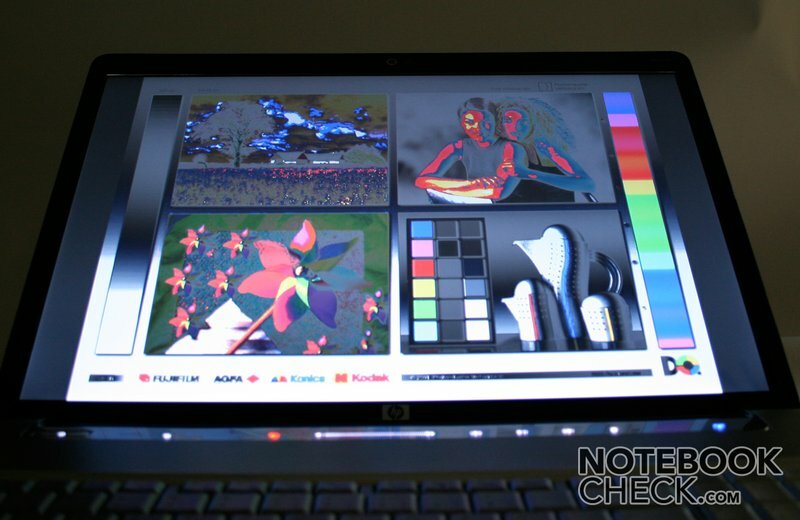 The 17 inch WXGA (1440x900) wide screen is called 'Infinity BrightView' by HP. However, the measured maximum brightness (in the middle of the screen) of 157 cd/m² is not very bright. Because of the reflecting surface, the brightness is only sufficient for indoor operation. Furthermore, you should not have a powerful light source in front of the screen, because this would lead to heavy reflections. Due to the low brightness, the contrast ratio of 183:1 is rather moderate (in the middle). At least the maximum brightness is not further limited in battery operation. 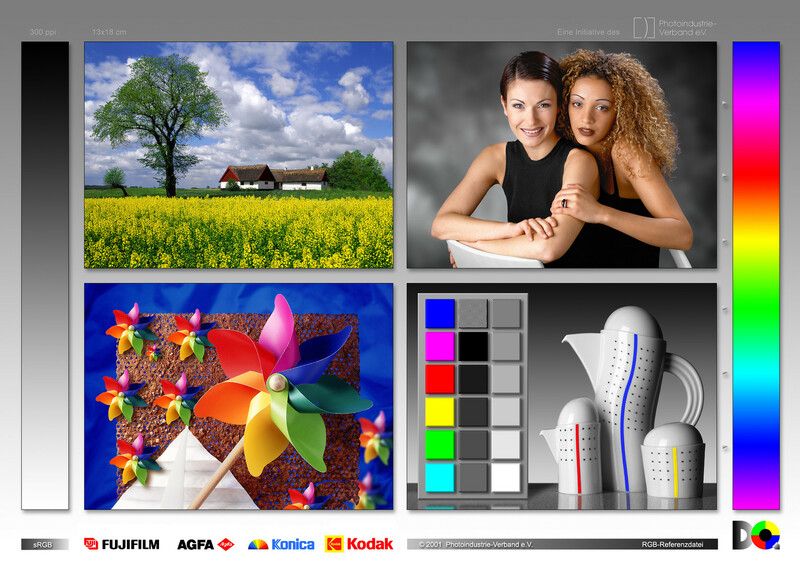 Subjectively, the colours appear rather neutral, however, the gray level gradients do not have a really smooth transistion from one grey level to the next. 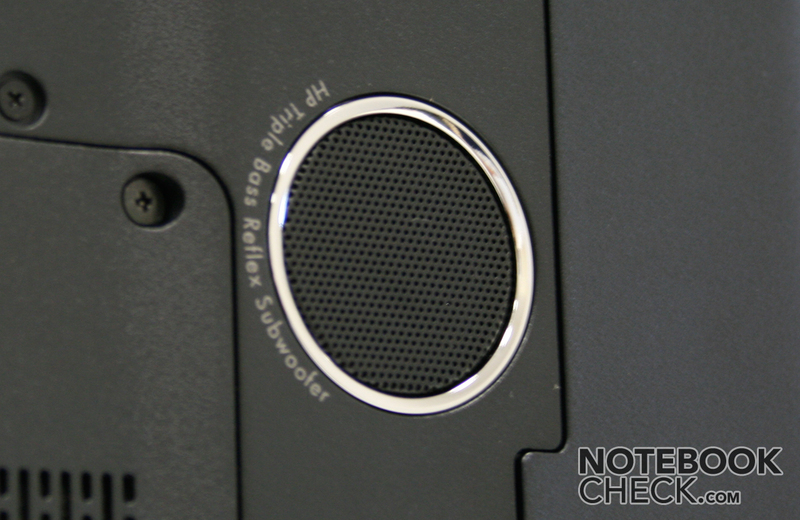 The viewing angles are typical for a TN panel of a notebook, horizontally sufficient, but vertically rather limited. Looking top down the contrast quickly gets too low, so that the displayed contents are no longer legible. 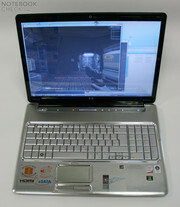 The HP dv7-1050eg is based on the brand new Intel Centrino 2 technology (Penryn processor with FSB1066 and Intel PM45 chipset). This is combined with an up-to-date middle-class graphics card by nVidia. The performance of the components proved to be as expected in our test. 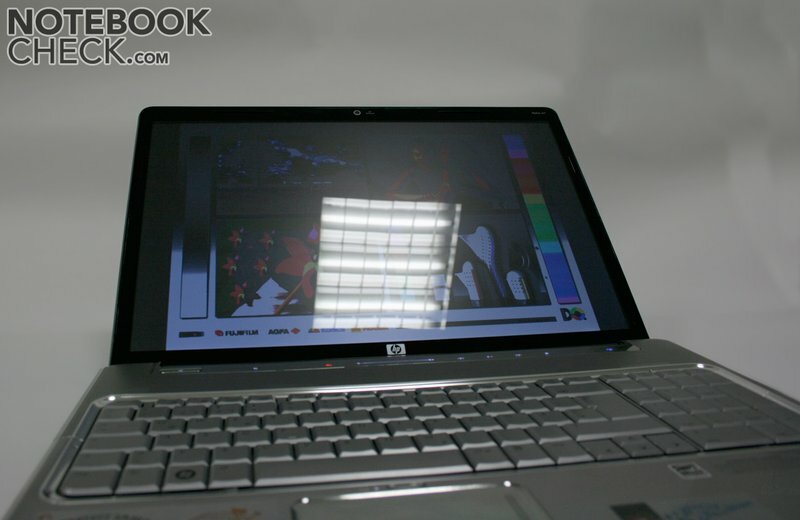 So, the HP dv7-1050eg can be called a powerful general-purpose PC. 4 GB RAM (whereby only 3 GB can be utilized with the installed 32 bit Vista) are also sufficient for demanding picture editing. 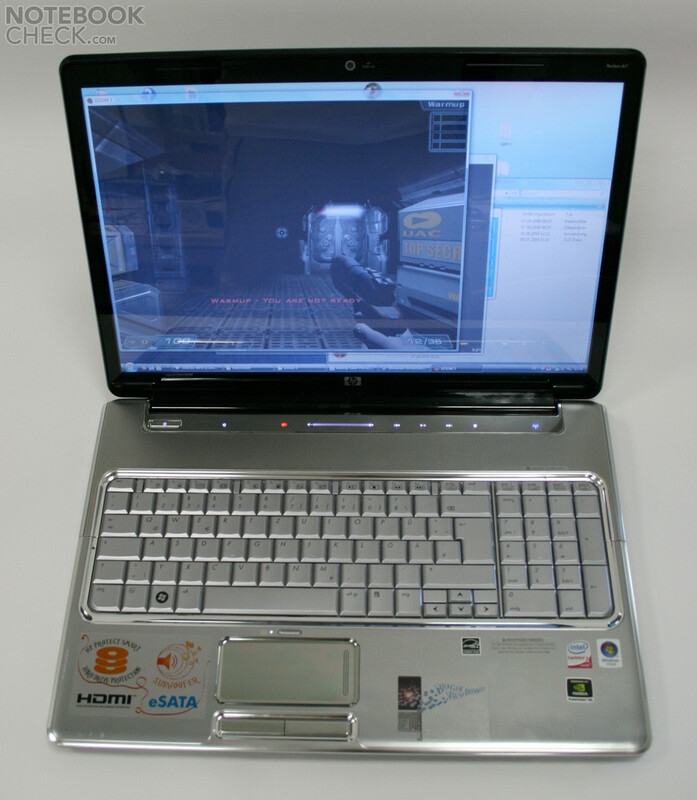 Alike the dv5-1032eg also the dv7-1050eg is equipped with an nVidia GeForce 9600M GT with GDDR2 video memory clocked with 400 MHz. It is about as powerful than its predecessor, the 8600M GT, but, with GDDR3. E.g., the results of the 3DMark 06 benchmark are about the same than of the older Dell XPS M1530. So, current games, like Unreal Tournament 3, Call of Duty 4, or Race Driver Grid run smoothly on middle to high details. 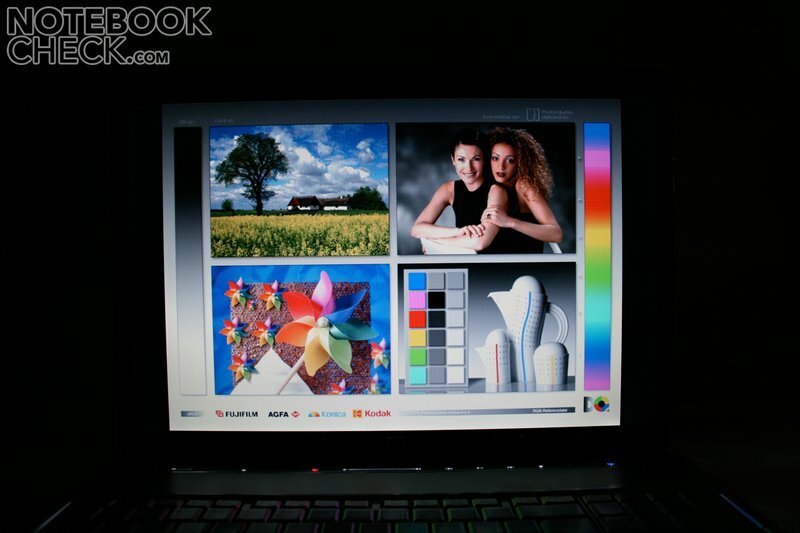 The Intel Core 2 Duo P8400 is a modern dual core processor and its performance is as expected good. Due to the fast 1066 MHz FSB (Front Side Bus) it reaches about the performance of the former top model CPU, the T7700. This should be sufficient for all current applications and also for today's games (whose performance is rather limited by the graphics card). 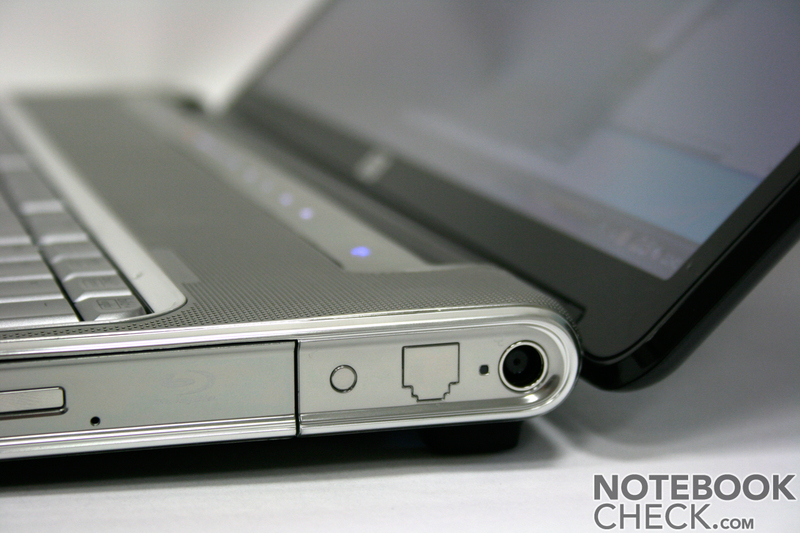 A distinctive feature of the HP dv7-1050eg is that it comes with two 320 GB hard disks by Fujitsu. This gives a total hard disk capacity of 640 GB (2 x 320 GB), which should be sufficient for a big media library. The performance was slightly above average in the test with a maximum transfer rate of 62 MB/s. Our volume measurements were constrained. The test was executed in an air conditioned room which unfortunately had a ambient noise of above 38dB. Because of this, it is not possible to say too much about the minimal system noise. 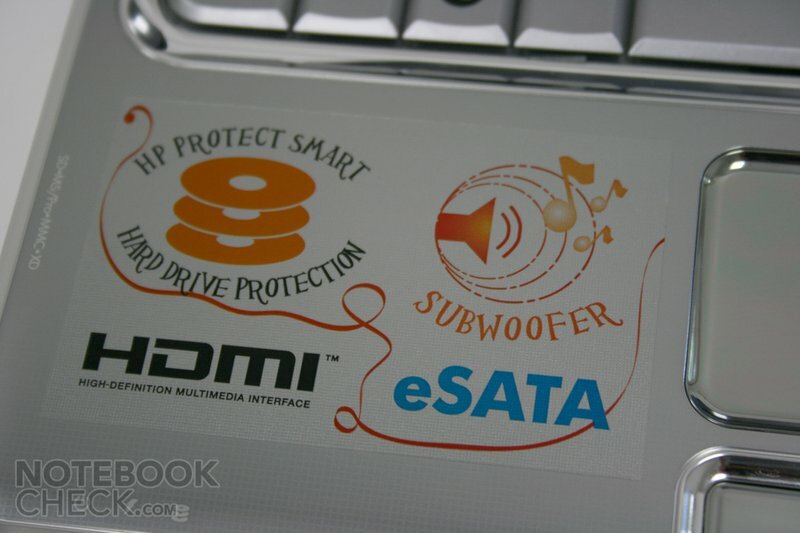 We were surprised that this notebook is louder than the smaller dv5 model, which has a similar equipment. We measured up to 46 dB under load. But, the dv7 was also clearly louder than the dv5 with lower load. The fan of the dv7 ran always - a fact that is also true for the dv5. But, subjectively, we did not find that the noise is gets unpleasant. Because the fan runs all the time, this notebook stays also relatively cold after a longer high load period. The maximum temperature of the top side is just 33°C, which is just hand-hot. On the underside we measured up to 39°C. 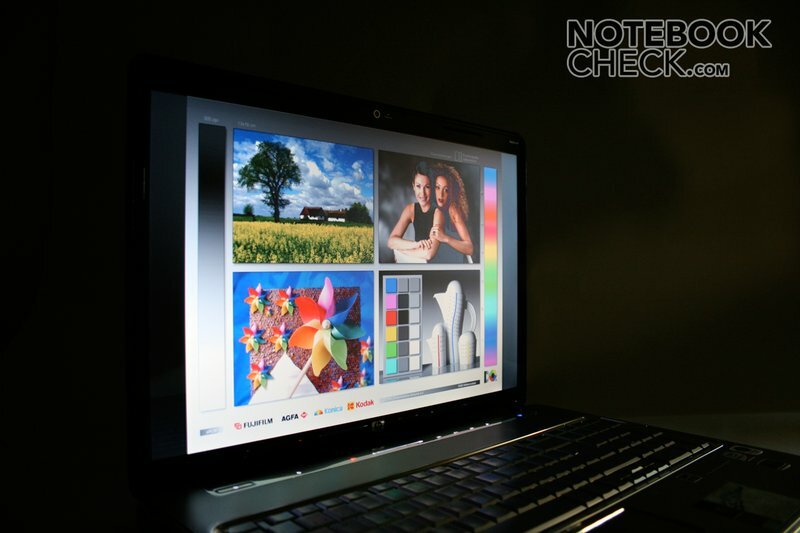 Considering this is a desktop replacement notebook this value is very good. (+) The average temperature for the upper side under maximal load is 31.6 °C / 89 F, compared to the average of 32.9 °C / 91 F for the devices in the class Gaming. (+) The maximum temperature on the upper side is 33.1 °C / 92 F, compared to the average of 39.3 °C / 103 F, ranging from 21.6 to 68.8 °C for the class Gaming. (+) The palmrests and touchpad are reaching skin temperature as a maximum (33.1 °C / 91.6 F) and are therefore not hot. (-) The average temperature of the palmrest area of similar devices was 28.7 °C / 83.7 F (-4.4 °C / -7.9 F). 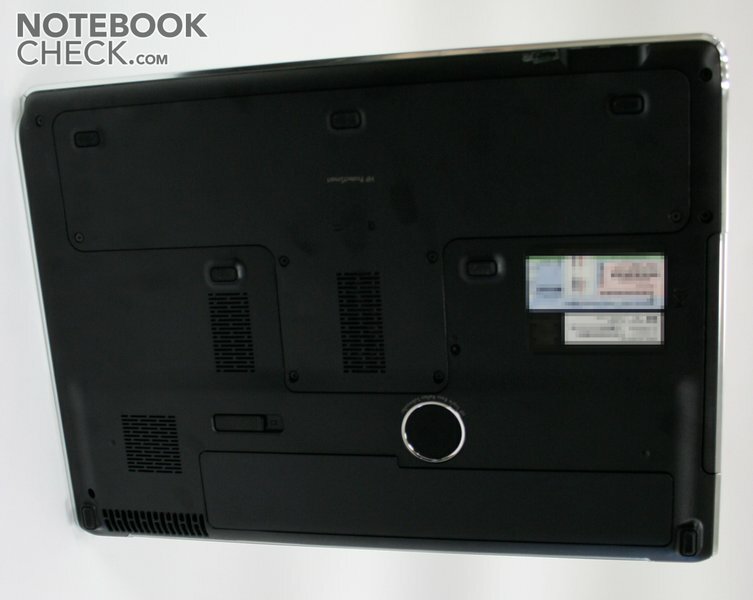 This 17" desktop replacement (DTR) notebook is equipped with a 2.1 sound system with two stereo loudspeakers above the keyboard and a subwoofer at its underside. Considering their size they have a very good sound with sufficient basses (but you should not expect a really powerful bass). However, the sound system slightly overdrives at maximum volume. 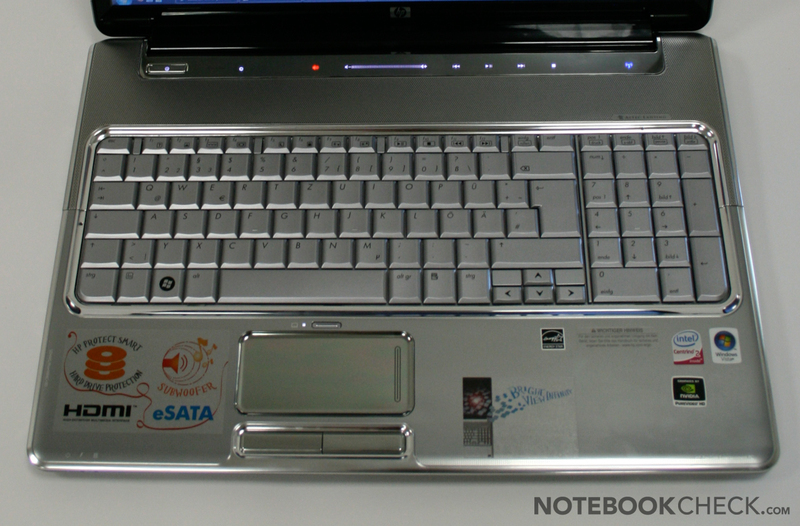 Due to a 73 Wh lithium ions battery, the battery runtime under full load of this HP laptop is one hour and 42 minutes. The runtime should be about 3 hours on standard load. 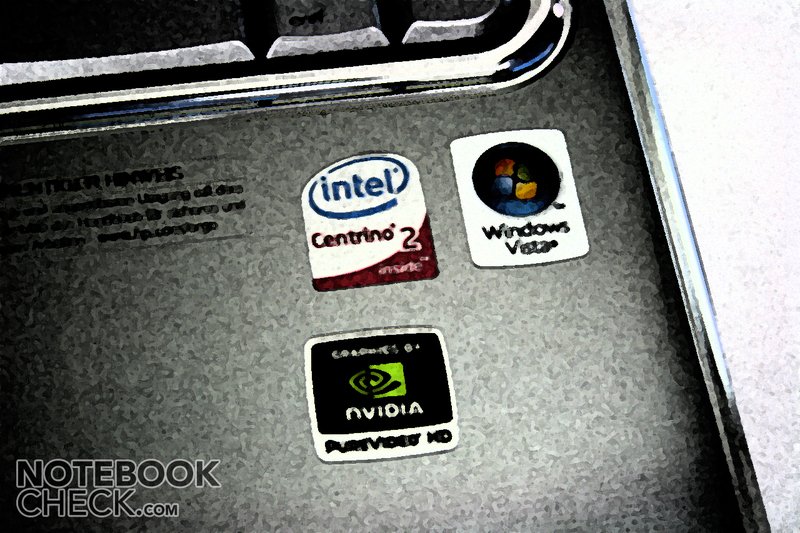 In standby or hibernation mode, and even if it is turned off, this notebook demands 4-6 Watts. This is in times of Green IT not really exemplary. The HP Pavilion dv7-1050eg scores points by a modern looking and robust case. There is no reason to complain about the equipment, which includes a Blu-Ray drive and an HDMI out for connecting a TV or an external screen. 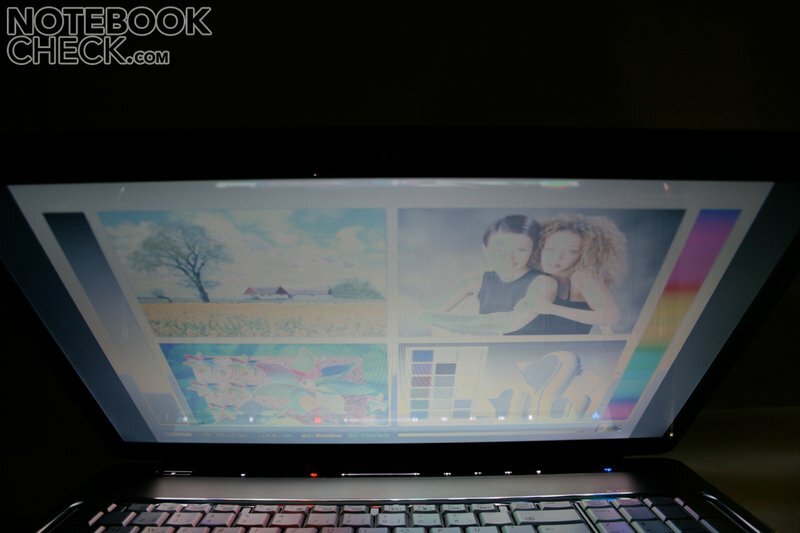 However, considering this is a multimedia notebook the built-in screen is too dark, and, so also reflects. The input devices inspire and disappoint at the same time. The keyboard convinces by an excellent layout which also includes a number pad. Typing is also very user-friendly. 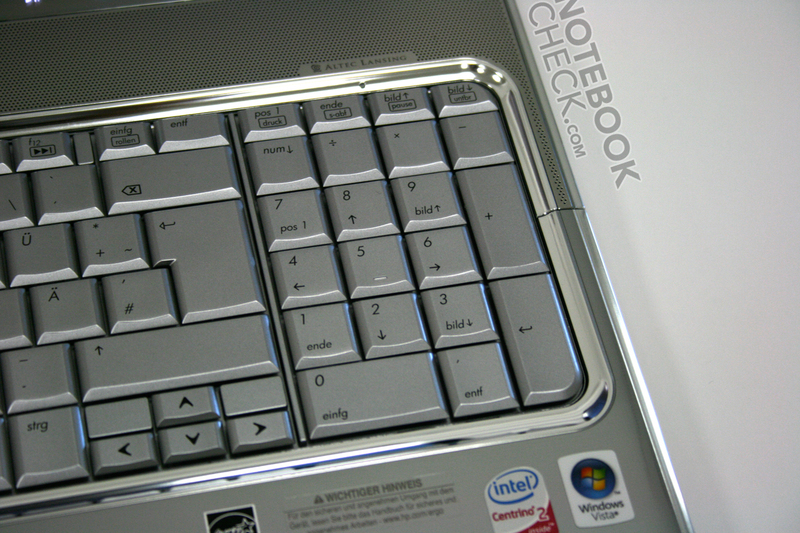 Unfortunately, the touchpad has only a good look, but, the gliding properties were not considered important. The performance of the HP dv7-1050eg is due to a fast Core 2 Duo processor and sufficient RAM, and a modern middle-class graphics card sufficient for quite all applications. 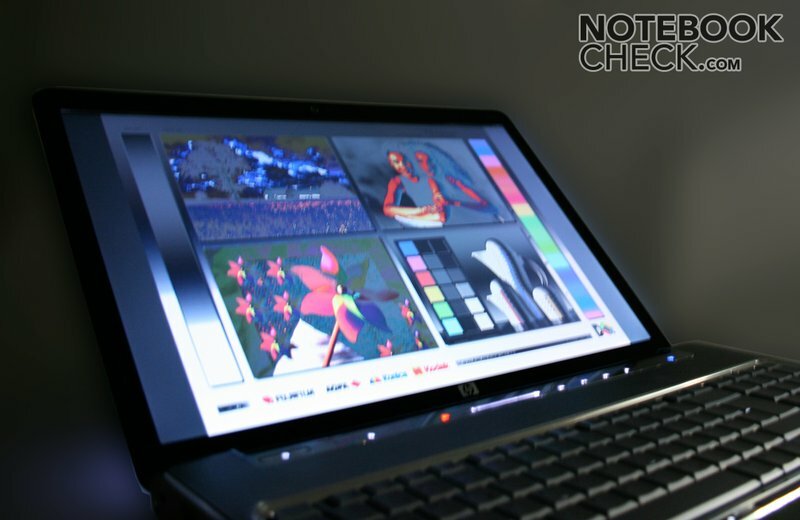 Only high-end gamers should rather buy a notebook with faster graphics card (e.g., a 9800M GT). But, this also requires more money. Considering the equipment, the price of 1200.- Euro is alright, especially if you want to use all the available feature (e.g., the Blu-Ray drive). Many thanks to the company MediaMarkt Wels, who kindly provided us with the test sample. You can also buy this notebook there. Due to a permanently running - and clearly audible - fan, the surfaces stay cold. As expected the P8400 CPU and the GeForce 9600M GT provide high performance. The big 17" display is unfortunately not very bright and, therefore, reflects. 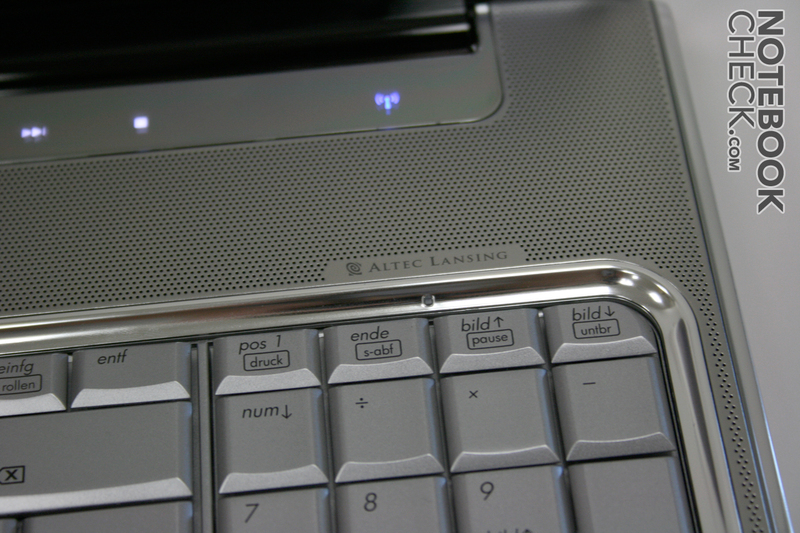 A sensor moulding above the keyboard allows fast access to important multimedia functions. 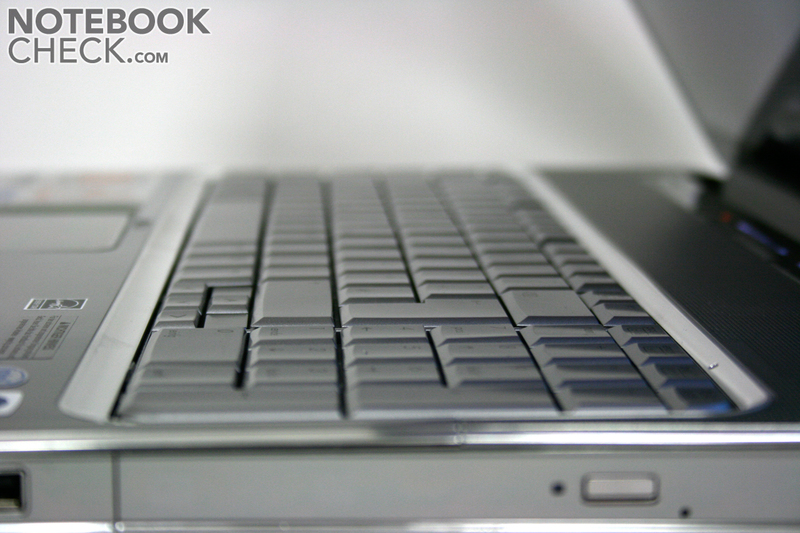 Although the touchpad is sufficiently big it disappoints, because its glossy surface has low gliding properties. Furthermore, this laptop has an integrated number pad. The built-in keyboard is user-friendly and has a good layout. The very complete equipment includes Blu-Ray ROM, HDMI, and docking station port. Unfortunately the high-gloss surfaces require a lot of cleaning. ... and a subwoofer at the underside and convinces by a very good sound.